Last January, 23 Whitworth students spent four weeks in South Africa in a course focusing on understanding the multi-ethnic people there as they continue to build a post-apartheid society. The class, "Contemporary South Africa," examines the historical, social, political, and religious contexts of South Africa. "Contemporary South Africa" focused mainly on learning about the history of apartheid and how, even 18 years after its disbanding, it still affects the country today. Students looked at current issues in the country and the historical context behind those events. "The South Africa study program has proven influential to the lives of many students," says Ron Pyle, chair of the communication studies department at Whitworth and one of the trip's leaders. "Living with and learning from South Africans can provide new perspectives on life, and being in situations that are sometimes uncomfortable – such as encountering poverty and injustice – can prompt us to consider many issues including justice, equality, reconciliation, privilege, and responsibility." Other professors who led "Contemporary South Africa" include Jennifer Holsinger, associate professor of sociology, and Larry Burnley, assistant professor of history and assistant vice president of diversity and intercultural relations. The course is offered during Jan Term every other year. Students began their journey on the country's southwestern tip in the city of Cape Town before moving northeast through the cities of Oudtshoorn, Grahamstown, Umtata, and Durban. They wrapped up the trip with a visit to the inland city of Johannesburg. The class met retired Methodist Rev. Peter Storey, Nelson Mandela's former chaplain who opposed apartheid and took part in many protests. Storey came to Whitworth in April 2009 to present that year's Simpson-Duvall lecture, "The Role of the Church in Peacemaking and Reconciliation in South Africa." Students also visited some of the most historically important sites in South African history, such as Robben Island, where Mandela was imprisoned, and the city of Soweto, where student protests helped bring worldwide attention to the injustices of apartheid. 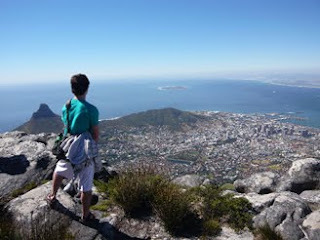 The class also worshipped with South Africans and spent some time sightseeing, including Cape Town's Table Mountain and the beaches of the Atlantic and Indian Oceans. Students reported that one of their most meaningful experiences of the trip was seeing amazingly faithful people serving in South African communities, according to Pyle. "During the month we witnessed efforts to educate, feed, provide medical attention, spiritually support, and house South African citizens," he says. In the evenings students stayed with host families of various backgrounds, including black South Africans, white Afrikaners, Muslim Indians, and white South Africans. Senior Emily McBroom said she had a wonderful experience with her Muslim host family. "My family was very hospitable and couldn't wait to tell us all about their culture and lives," says McBroom, a theology major. "They also really loved hearing about our lives, too. It made me see so many similarities between our lives." McBroom said hearing individual South Africans' personal stories was one of her most meaningful experiences of the trip. Everyone they spoke to, she says, was willing to show their story. "This trip changed my life," McBroom says. "I am still attempting to figure out how exactly, but I know that I am different and I feel blessed to have learned so much about myself and the world in one month."